SATURDAY in LONDON - About 2,000 spectators crowded the stage in Indonesia Ciutadella Park and dissolved in the strains of Javanese gamelan brought by Charoko Laras KBRI Madrid. 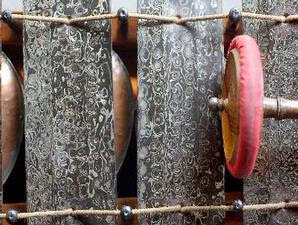 "Lung Park Barcelona city was rocked by the richness of gamelan music, on top of the cultural performances of Asia Festival in Barcelona," said Allen Simarmata, Korfungsi Sosbudpen KBRI Madrid to London correspondent, Saturday. He said, visitors who huddled in the park watching enthusiastically perform by Charoko Barrel in twice for an hour by displaying song Gangsaran, Ayun-Ayun, Sluku-and Udan Sluku Batok Mas. Besides gamelan, Embassy also held a dance show hosted Indonesian dancer’s in Madrid and dance groups offering guided Embassy Brussels. Indonesia Performing arts dance form that brought five dancers that appeared dazzling with great applause from the visitors. "Applause" visitors to rumble when the dancers brought Batanggai Muli Dance and Dance from Lampung Rantak from West Sumatra, with nimble movements and costumes are attractive dancers. Indonesia's Ambassador to the Kingdom of Spain, Slamet Mustafa who present with Casa Asia Barcelona officials pleased and happy with the tremendous response Barcelona on gamelan and dance performances Indonesia. According to Allen Simarmata, Barcelona city sun stung enough in the day did not discourage visitors to see the performances of gamelan and dance. Asian Festival is a cultural and music festivals held regularly every year by Pemko Barcelona and Casa Asia is a consortium of two target culture Spanish foreign ministries. Groups Indonesian art and culture as filler specially invited top Asian Festival of culture in 2009 with a group from China and India, said Allen Simarmata.